www.photomacrography.net :: View topic - Why are my nematodes always straight and rigid? Why are my nematodes always straight and rigid? 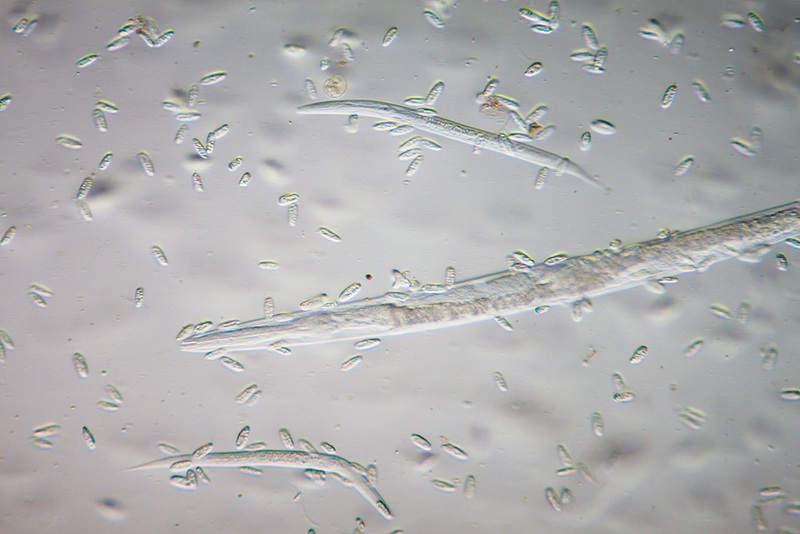 Posted: Fri Feb 17, 2017 10:39 am Post subject: Why are my nematodes always straight and rigid? I'm used to not recognizing things in water samples, but usually things make sense after enough study. This one, however, has got me stumped. The sample started as some surface debris picked out of a freshwater drainage ditch back in mid-December. I maintained the original sample for a while, then started a new culture in medium consisting of dead leaves and snow, boiled thoroughly to kill whatever might be in it. The culture seems to be doing fine -- lots of organisms of various shapes and sizes, with the population changing in proportion over time. 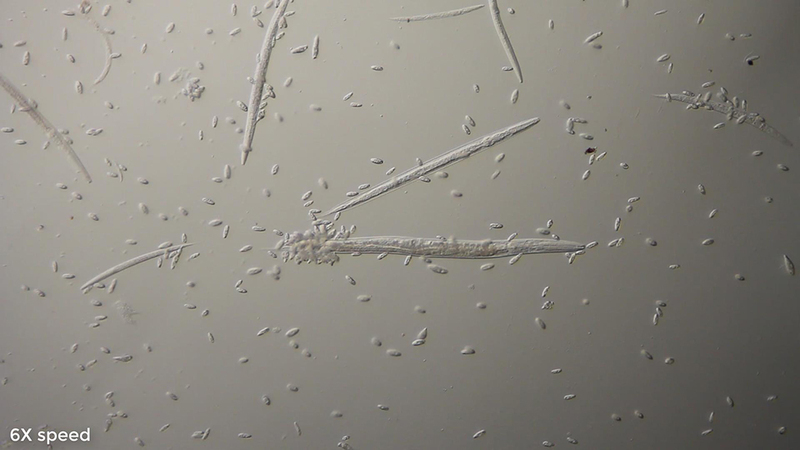 Most of the stuff seemed familiar as various sorts of ciliates and flagellates, but there were some large straight rigid things that I just didn't recognize. The wriggly ones look like nematodes, so by extension I guess the straight rigid ones must be nematodes too. But then, why do I almost always see them as straight and rigid?? 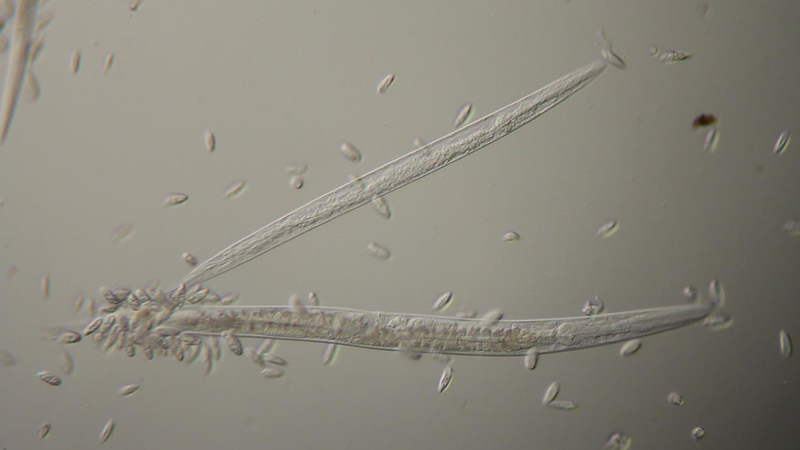 Skimming the literature, I see descriptions that nematodes often assume a "hockey stick" posture when they're getting ready to molt. I see maybe one of those at the bottom of the last image, but most of them are just straight. I would think maybe they were corpses, or under severe stress, but they're like this every time I look, and judging from density and variability the culture is doing fine. Even the individuals are clearly not dead, for example the larger one in the video shifted its shape a little even while the video was being shot. I'm bumping this thread to ask for guidance. I just looked again at the culture, and it is the same story. There are a few wrigglers, but over 90% of individuals are straight and rigid. If the straight ones are all dead, then I am in awe at the inefficiency of the decay and scavenging processes in this jar of rotting leaves, swarming ciliates, and meandering flagellates. So, what should I study or who should I ask, that could maybe answer the question: "Why are my nematodes always straight and rigid?" He probably knows worms than most for members.